Following an adrenaline filled start to the Clipper 2017-18 Race, with big crowds and international media turning out to see the twelve teams and 247 crew members on their way for Leg 1 to Punta del Esta, the largest race edition yet, and the competition for race standings is now well underway. With less than 20 nautical miles separating the fleet between first and twelfth place, positions are expected to change regularly over the next 24 hours. Once clear of the River Mersey, teams began to progress towards the Irish sea, but changeable and fickle wind conditions teamed with close proximity racing overnight made for a tiring night with regular sail changes and movement of leader board positions. Another team currently striving to make up lost ground is Qingdao. Skipper Chris Kobusch explains: “The Qingdao crew threw in some flawless tacks and sailed us into second position until a tactical error from my side put us into the shallow edges of the river mouth and outside the tide. The crew of Liverpool 2018 are in high spirits considering their twelfth-place position (0900 BST). Lance Shepherd commented: “There is a long way to go so we are not worried about positions at this stage. 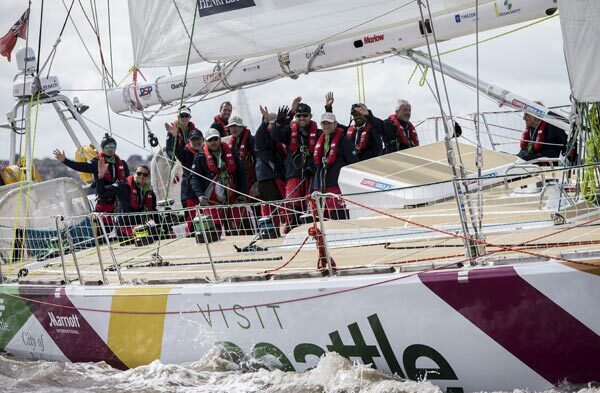 With teams settling into watch systems, they have had a chance to reflect on the momentous Liverpool start, which marked a special moment in their Clipper Race journey. Skipper Roy Taylor, PSP Logistics, said: “It was a great departure from Liverpool and fantastic to see so many of the team and supporters down to see us off (or just to make sure we actually departed!)”. But the most reflective of all was Greenings team Skipper Dave Hartshorn: “A big thank you to Andrew Greening, his family and his team for the incredible support they have displayed during our preparation. They all demonstrated their mission statement of values through people. The crew feel very valued by our team partner. “The biggest thank you goes out to you, our family and friends, who have supported us in getting this far. We all truly appreciate the support you have given us and understand the personal sacrifice you are making while we all go and live our dream. GREAT Britain, currently in tenth position, is the first ever Clipper Race team to play the Joker Card, a new single-use tactical move introduced for the 2017-18 race edition which doubles accrued points for one selected race. Follow the fleet’s progress the Race Viewer as the teams move through the Irish Sea and head to towards the Atlantic Ocean.